Saunas and solariums are common in many gyms these days and there are also dedicated businesses which provide one, the other or both of these facilities. 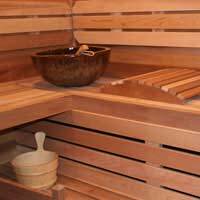 Saunas are beneficial as they cause you to sweat and this releases impurities from the blood and gets rid of other body toxins. They also help to improve blood flow and can have a relaxing effect, which is especially beneficial to people who suffer with anxiety problems or insomnia. They are perfectly safe providing you take safety precautions. Solariums, however, need to be treated with a good degree of caution. As they are a tanning aid, we should all be fully aware by now of the dangers of exposure to harmful UVA and UVB radiation. Despite this, many people still use them as they prefer to have a suntan and to maintain it, regardless of the risks involved. Here are some safety tips for using a sauna and the things you should be aware of, should you choose to use a solarium. Within reason, people of all ages, apart from the extremely young or old, can benefit from using saunas but there are still risks involved. You shouldn’t eat a heavy meal before taking a sauna as, due to the heat generated within a sauna, your body needs to utilise its full resources to regulate your temperature and do its best to cool you down and it will find this difficult to do as effectively if it’s also trying to digest a heavy meal. By all means, have a snack or a piece of fruit before taking a sauna but go easy. On the other hand, you should drink plenty of water before entering a sauna because of the heat intensity and the fact that you’ll need to replace your body’s fluids due to you perspiring. Never take a sauna after drinking alcohol as this will only further compound the effects of dehydration which alcohol causes anyway, even without exposure to a sauna environment. If you ignore this advice, a sauna will almost certainly make you feel light-headed, induce headaches and could even cause you to faint. Twenty minutes or so is long enough for a sauna session but children shouldn’t stay in one as long as their sweat glands aren’t as well developed as those in adults. Those with existing medical conditions such as having heart problems, high or low blood pressure and women who are pregnant should be extremely cautious about using a sauna and, for people with these kinds of conditions and others who have some concerns over their health, you should refrain from using a sauna or, at the very least, seek advice from your GP first. The only real ‘benefit’ that could be perceived as a result of using a solarium is for those who like to have a suntan year-round. Apart from that, solariums only present potential problems and risks to those who use them. Simply put, they produce ultraviolet rays, just the same as the sun, and we’re all familiar with the various health risks that prolonged exposure to the sun can cause. Most people who want to avoid risks from the sun would not dream of lying out in it for more than a couple of hours a day so if you consider that as little as 20 minutes in a solarium is the equivalent of lying in the sun for at least 4 hours, you can start to perceive the risks you are taking. Therefore, you should not be looking to stay in one for longer than 10 minutes in one session and perhaps even less, depending upon its level of intensity. If you insist on using a solarium, always wear protective goggles to prevent your eyes from being permanently damaged. Exposure to both the UVA and UVB rays generated by a solarium can burn the cornea of the eyes and can cause cataracts to develop. You should also wear sunscreen. OK, you want a suntan but would you consider lying on a beach without using some kind of sun protection cream? Probably not, so treat a solarium in just the same manner. And, remember, whilst you may think, in your younger years particularly, that a tan makes you feel good and looks more attractive, ultimately it will speed up the process of wrinkles developing and cause your skin to thin more quickly. Therefore, as you get older, if you’ve had regular exposure to a solarium, you’re far more likely to look older than people of the same age. So, the question has to be……are the health risks to getting a tan truly worth it in the long term?